EVERYBODY LOVES JANUARY in the Pacific Northwest! OK — that might not actually be true, but it ought to be, at least among curious botanists, backyard gardeners and others who take an interest in horticultural happenings. 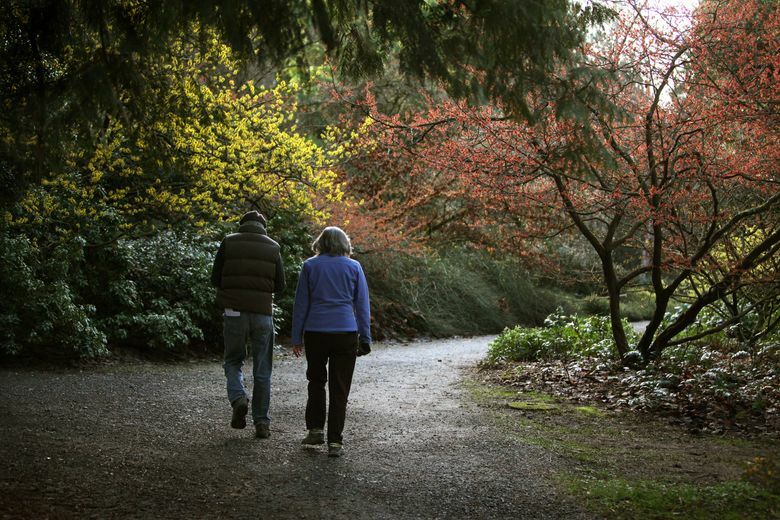 On a dreary day, you can always find a crowd of those folks at the Washington Park Arboretum’s Joseph A. Witt Winter Garden, which puts on a display of botanical greatness when the rest of the plant world is fast asleep. The Arboretum has assembled an astounding selection of plants with winter interest, but today I will try to convince you that the witch hazels alone justify a cold-weather expedition. The witch hazel is a truly glorious plant, providing impressive blossoms in the dead of winter, just when you need them most. 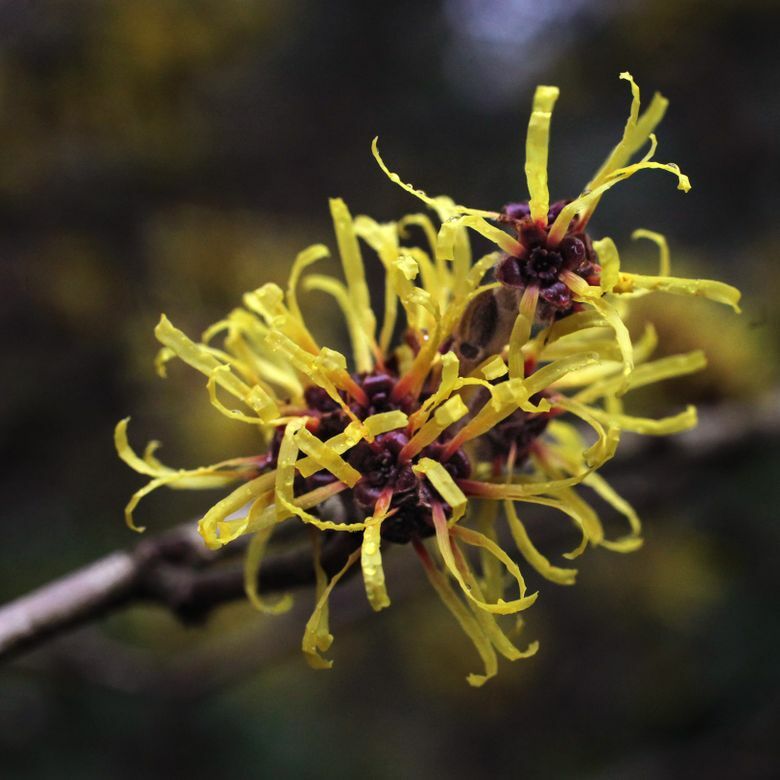 The origin of the common name, witch hazel, is shrouded in mystery, which seems appropriate. Whether there was ever an association with witches and mysticism is unclear, but we know that witch hazel sticks were commonly used as divining rods in the old days, which certainly adds to their allure. I consider it likely that at least one famous wizard has carried a wand crafted from a Hamamelis branch. Hamamelis x intermedia are commonly available at nurseries, and are the most widely used witch hazel species in landscape applications today. X intermedia are hybrids of Japanese witch hazel (H. japonica) and Chinese witch hazel (H. mollis). The crossing of these species creates plants that are more compact, sturdier and showier than their parents. X intermedia have an impressive range of fall leaf and bloom color, covering the spectrum from red through orange and into bright yellows. In addition to coloration, the vase-like body shape and textured oval leaves of these relatively short (10 to 20 feet) deciduous shrubs make them a year-round focal point in the garden. If you’re curious about the range of Hamamelis species and are hankering for a field trip this month, I highly recommend a trip to the Arboretum. Its collections contain American, Japanese, Chinese and hybridized varieties, and can help you decide which one of those charming options might be right for your landscape. Witch hazels are featured in two distinct areas of the Arboretum, so plan to visit both the Joseph A. Witt Winter Garden near the visitor center, and the Witch Hazel Family Area toward the southern end of the park (check out the Arboretum’s maps to ensure you don’t miss anything). 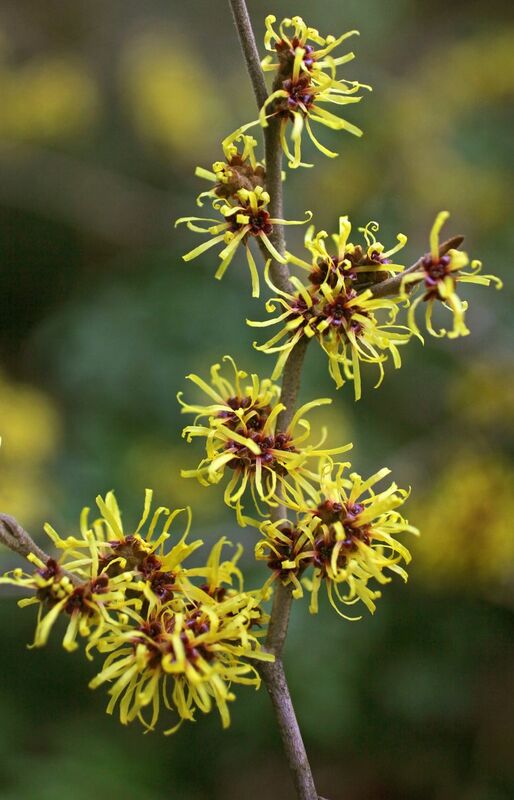 In the Winter Garden, look for witch hazels in Bed A, Bed K and the Kaempferi Bed (which is where you’ll see more of the Asian winter-flowering species). In the Arboretum’s Witch Hazel Family Area, you can investigate the broad range of species in the entire Hamamelidaceae family, and then impress your friends at dinner when you pronounce Hamamelidaceae correctly. Got garden questions? Send them along. We’re collecting questions for a series of Q&A columns throughout the year.